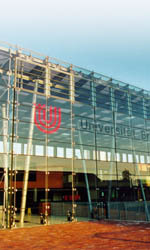 Streetcar line number 6 goes directly to the university from from Bremen airport and the main railway station. Taxis stand in front of the airport and at both exits of the main railway station. Leave the A27 at exit number 19 "Horn-Lehe/Universität". At the second intersection turn right into "Universitätsallee" ("University Alley"). At the next traffic lights turn right again into the the Enrique-Schmidt-Strasse. Use the the parking lot there. The parking fee is 0.70 Euro per day. Get off the streetcar line 6 at the stop "Universität / Zentralbereich". The bus lines 21, 28, and 32 also go to the university.